Pushing The Edge is the tagline we use here at The BOSS Snowplow. It describes the way we do business, the way we innovate and the way we treat our customers. It defines who we are today and who we will be in the future. While we are Pushing The Edge in the snowplow manufacturing market, there are many others who are Pushing The Edge each day in extraordinary ways. Let me introduce you to, Kelly Allen, small town girl, born and raised in the Upper Peninsula of Michigan, the youngest of four siblings, accomplished high school athlete and college bound student. Sounds fairly typical right? Now, what if I told you Kelly has also taken home four gold medals in women’s kayaking and two silver medals in rock climbing at an annual extreme sports competition. Impressive right for a nineteen year old from a small little town in Upper Michigan? Now, how about if I told you that Kelly was born with PFFD? Proximal Femoral Focal Deficiency (PFFD) is a rare condition that affects musculoskeletal development. Kelly Allen, accomplished high school athlete, college bound student, gold and silver medalist was born without her left femur, patella, and fibula and without a fully developed hip socket. Because of this birth defect, Kelly has learned to adapt to everyday life in extraordinary ways using her prosthetic leg. Kelly has defied the expectations of the doctors that had told her parents that she would not be able to sit or stand and that there would be no hope of being an athlete. At the age of seventeen, Kelly was inducted into the National Disabilities Hall of Fame and was presented with the 2009 Rising Star Award. The Mark “Doc” Andrews Rising Star Award recognizes a young athlete that has competed at a local, regional and national level and has demonstrated extraordinary effort, achievement and commitment as an athlete with a disability. Kelly’s story doesn’t stop here. In addition to kayaking, rock climbing, golfing and playing tennis, Kelly also started skiing when she was a freshman in high school. 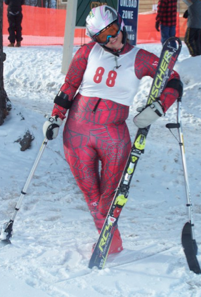 She spent four years on the Kingsford High School ski team and has competed in three NASTAR/Level 1 adaptive ski races. This September, Kelly was presented with a tremendous opportunity. She was selected to train for the 2014 Winter Paralympic Games in Sochi, Russia. So, this small town girl from Upper Michigan has packed her bags and has headed to the mountains of Colorado. She will be living in Frisco and will be training with a local able bodied team, Team Summit, along with Mau Thompson and Adaptive Adventures. Kelly has already started her training on dry land as they wait, like many of us, for the arrival of snow. We at The BOSS Snowplow are honored to support Kelly in her goal of becoming a 2014 Winter Paralympic athlete. We look forward to cheering her on as she continues to Push The Edge on the slopes and in life.